Multi-award-winning musical Come From Away arrives in the West End, following huge critical acclaim on Broadway. Transferring to London’s Phoenix Theatre, the emotional musical documents the remarkable, true story surrounding 9/11, as 7,000 passengers find themselves stranded in Newfoundland. A brand new musical from Irene Sankoff and David Hein, the story has captured the hearts of theatregoers from across the globe. The Phoenix Theatre box office is open Monday to Saturday from 10am to 6pm for advance sales. Customers collecting tickets for a show can do so up until the performance is due to begin; they will need their booking reference number as well as the credit or debit card used to make the payment. Originally opening in 1930, the Phoenix Theatre hosted a variety of plays, with its first ever play being the premiere of Noel Coward's Private Lives, starring Laurence Olivier. Further early productions included Tonight at 8:30 (1936), John Gielgud's Love for Love, Under the Counter (1945), The Skin of our Teeth (1945), Terence Rattigan's Harlequinade and The Browning Version (1948) and Quadrille (1952). Throughout the 60's, the theatre saw plays such as Chaucer's The Canterbury Tales (1968), which ran for approximately 2,000 performances. In 1969, the theatre celebrated its long association with Noel Coward by renaming the foyer bar the Noel Coward Bar on his 70th Birthday. Notable productions have included Tom Stoppard's Night and Day (1978), with a variety of musical productions throughout the 1980's and 90's, such as The Biograph Girl, Stephen Schwartz's The Baker's Wife and Stephen Sondheim's Into the Woods. In 1983, the Phoenix Theatre hosted its first ever pantomime, Snow White and the Seven Dwarfs. 1991 saw the theatre make history with the enormous success of Willy Russell's musical Blood Brothers, which transferred over from the Noel Coward Theatre. Running for an impressive 21 years, the musical closed in 2012, making it the venue's longest-running production and one of the longest running productions in West End history. Following the departure of Blood Brothers, the Phoenix hosted limited runs of Goodnight Mr Tom (2012), Midnight Tango (2013) and Dinosaur Zoo (2013), before becoming home to the Broadway transfer of Enda Walsh's musical Once (2013-2015). In 2015, the Phoenix hosted the world premiere of new musical Bend it Like Beckham, based on the hit British film. After a successful year run, the production closed and was followed by the Savoy Theatre transfer of Guys and Dolls (2016), starring Hollywood favourite Rebel Wilson. 2016 productions have included Strictly Come Dancing duo Vincent Simone and Flavia Cacache's The Last Tango, with a one-month run of the Dirty Dancing tour and a season run of Peppa Pig's Surprise. 2017 kicked off with the London premiere of Gary Barlow and Tim Firth's new musical The Girls, based on the hit film Calendar Girls, which successfully ran at the venue until July 15th. Bill Kenwright's UK tour of Andrew Lloyd Webber and Tim Rice musical Evita also landed at the Phoenix Theatre, starring Emma Hatton. The year rounded off with Bill Kenwright's new production of The Exorcist, which continued into 2018. In 2018, Broadway musical Chicago came to the theatre, and featured many celebrity faces including Alexandra Burke and Duncan James before closing in January 2019. 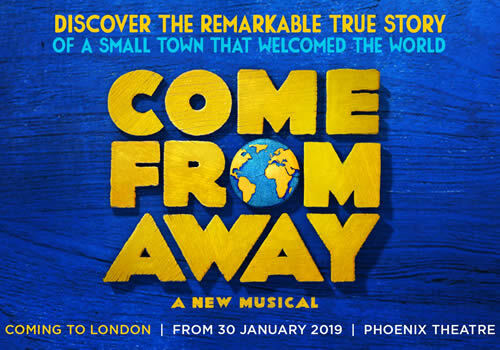 Broadway musical Come From Away arrives at the Phoenix Theatre in 2019.